As has previously been reported on this blog, the organisers of the Global March to Jerusalem have been quite happy to accept operational support from Gilad Atzmon, particularly in the field of fundraising for the North American chapter. Several individual or group endorsers of the march apparently see no dissonance in supporting a project which makes use of Atzmon’s public profile whilst at the same time condemning his anti-Semitism. “Israeli press reported this evening that French gunman Mohamed Merah had been on a trip to Israel in the past. GMJ endorsers and International Advisory Board members such as Ghada Karmi and Susan Abulhawa have claimed that the march should appeal to “people of conscience”. The Global March to Jerusalem’s association with Gilad Atzmon is an indication of the extent to which its organisers and endorsers in fact suffer from self-imposed selective hearing on issues of conscience. Signatory Haidar Eid is both an endorser of (along with co-signatories Ali Abunimah, Nadia Hijab and Omar Barghouti) and activist with the ‘Gaza Freedom March’ organization which is promoting the Global March to Jerusalem on its website. Signatory Abir Kobty (also Kopty) from Nazareth is a member of the board of the Coalition of Women for Peace which is an endorser of the ‘Free Gaza’ campaign – represented among the GMJ organisers by European Preparatory Committee member Mikalis Lukianos from ‘Ship to Gaza-Greece‘, Huweida Arraf and Feroze Mithiborwala (FGM International Co-ordinator in India). 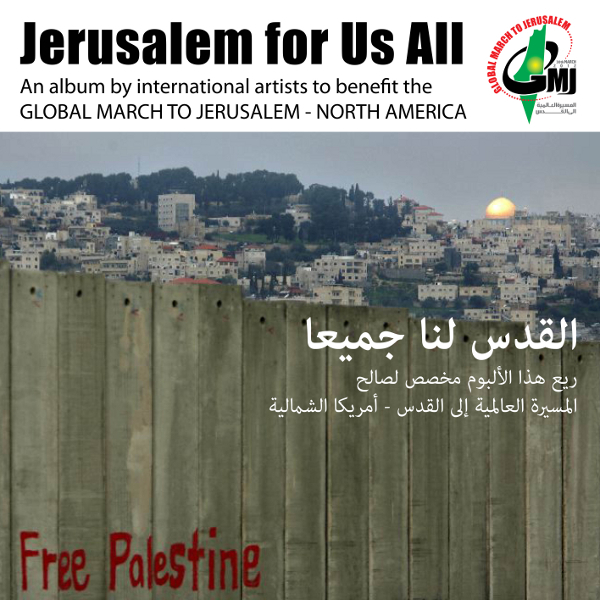 The Global March to Jerusalem-North America website is advertising the sale of “Jerusalem for Us All: an album by international artists to benefit the Global March to Jerusalem – North America”. The album features tracks by the anti-Semitic and Holocaust denier-supporting saxophone-player Gilad Atzmon and other musicians , many of whom he has collaborated with in the past.